The Global Volcanism Program has no activity reports for Iwakisan. The Global Volcanism Program has no Weekly Reports available for Iwakisan. The Global Volcanism Program has no Bulletin Reports available for Iwakisan. Iwakisan volcano, symmetrical on all but its western flanks, has been called the Fujisan of the Tsugaru district. The 2-km-wide summit crater is filled by a lava dome flanked by six explosion craters. Three lava domes are found on the western and southern flanks of the andesitic volcano, the NW-most active volcano in Honshu. Historical eruptions have been reported here since 1600 CE and have consisted primarily of small-to-moderate phreatic explosions. There is data available for 29 Holocene eruptive periods. 1844 Apr 7 Unknown Confirmed 2 Historical Observations Summit and south flank? There is no Deformation History data available for Iwakisan. There is no Emissions History data available for Iwakisan. The irregular summit lava dome filling the central crater of Iwaki volcano forms the high point in this view of the SE side of the volcano. Chokai-san is the rounded peak on the left. The summit lava dome is flanked by six explosion craters. Debris-avalanche deposits from repeated collapse of the summit and flanks surround the volcano on all sides. Historical eruptions have been reported since 1597 and have consisted primarily of small-to-moderate phreatic explosions. Copyrighted photo by Shingo Takeuchi (Japanese Quaternary Volcanoes database, RIODB, http://riodb02.ibase.aist.go.jp/strata/VOL_JP/EN/index.htm and Geol Surv Japan, AIST, http://www.gsj.jp/). 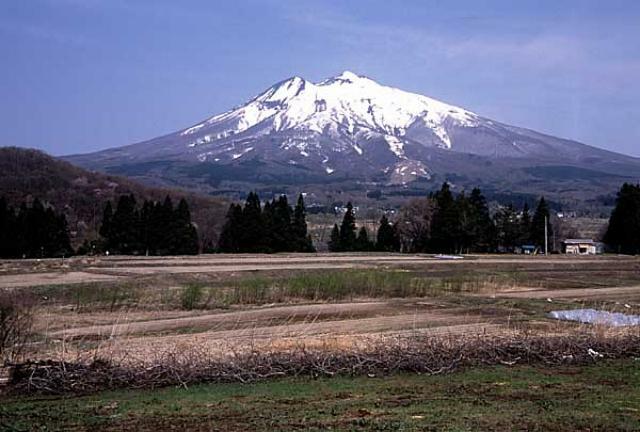 Snow-capped Iwaki stratovolcano rises above farmlands below its SE flank. The peak at the left side of the summit is Chokai-san. Iwaki volcano, symmetrical on all but its western flanks, has been called the Fuji-san of the Tsugaru district. The 2-km-wide summit crater is filled by a lava dome that forms the high point of the volcano. Historical eruptions have been reported since 1597 and have consisted primarily of small-to-moderate phreatic explosions. Copyrighted photo by Yoshihiro Ishizuka (Japanese Quaternary Volcanoes database, RIODB, http://riodb02.ibase.aist.go.jp/strata/VOL_JP/EN/index.htm and Geol Surv Japan, AIST, http://www.gsj.jp/). Large Eruptions of Iwakisan Information about large Quaternary eruptions (VEI >= 4) is cataloged in the Large Magnitude Explosive Volcanic Eruptions (LaMEVE) database of the Volcano Global Risk Identification and Analysis Project (VOGRIPA).